Greetings from the 2013 IAAPA trade show at the Orange County Convention Center in Orlando where I can honestly say, this year’s show is not only bigger than ever before, but it’s also busier. It seems that every booth I passed by over the last two days are not filled with browsers, but shoppers. There are clearly negotiations and deals happening all over the floor, which is not only a good sign for the attractions industry, but the economy. So let’s dive in, shall we? 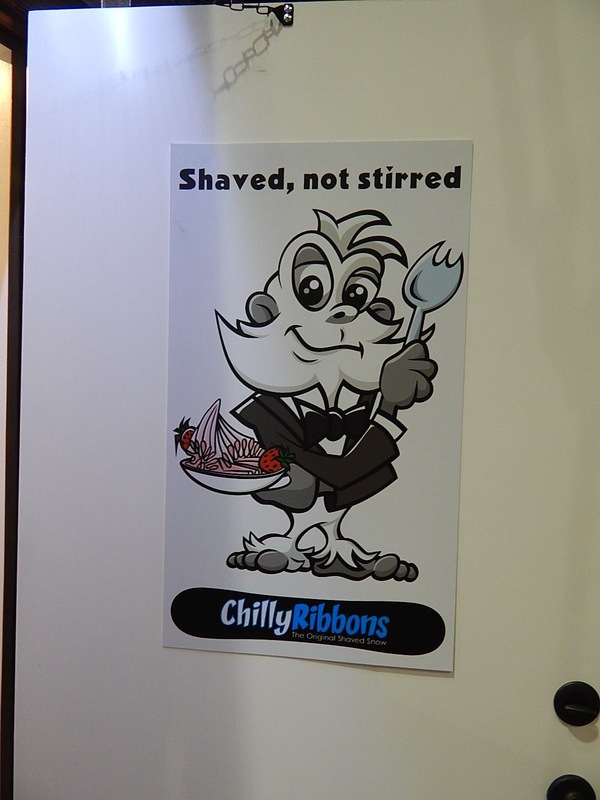 Chilly Ribbons is a new icy treat that is relatively new to American audiences. Ask anyone in Asia what this treat is and they will not only sing it’s praises, but verify how popular it is. This company is hoping to not only piggy back onto the do-it-yourself yogurt craze that is sweeping the country, but to also expand it’s footprint into theme parks as well. The custom made miniature ice chalet can be purchased for any theme or water park and even comes with “snow” that can fall from the chimney! When American’s think of shaved ice, usually a picture of a giant block of clear solid ice in a giant machine that turns it into tiny crystals and then doused with a heavy flavored corn syrup of some sort comes to mind. 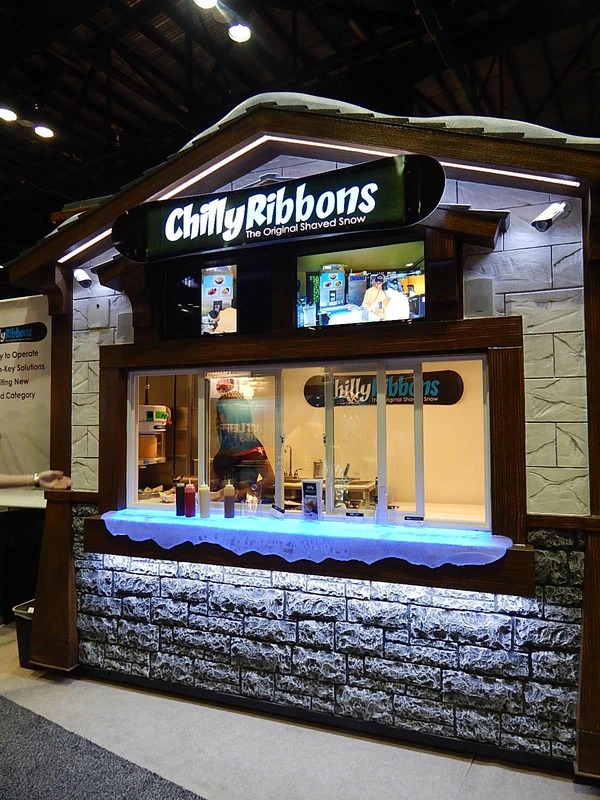 Chilly Ribbons actually flavors the ice before it’s even frozen, often using real fruit juices and purees. 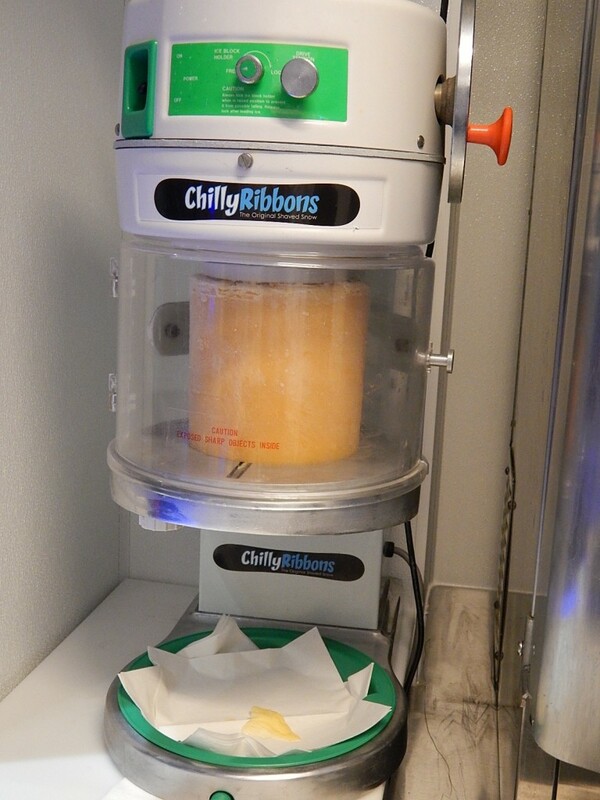 The flavored ice is made at the Chilly Ribbons facility then shipped frozen to retailers, restaurants and hopefully theme parks around the country ready to be shaved into ribbons The machine seen above is used for a single flavor of the product, but for theme park use they had to make a version that could accommodate more flavors. So they made a machine that can serve up to three flavors at one time. 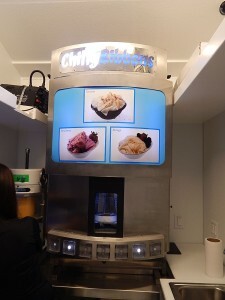 In total, Chilly Ribbons has forty flavors including orange, strawberry, coconut, vanilla, maple and many more. They even have toppings like caramel, sprinkles or fresh fruit to turn the dessert into a sundae. 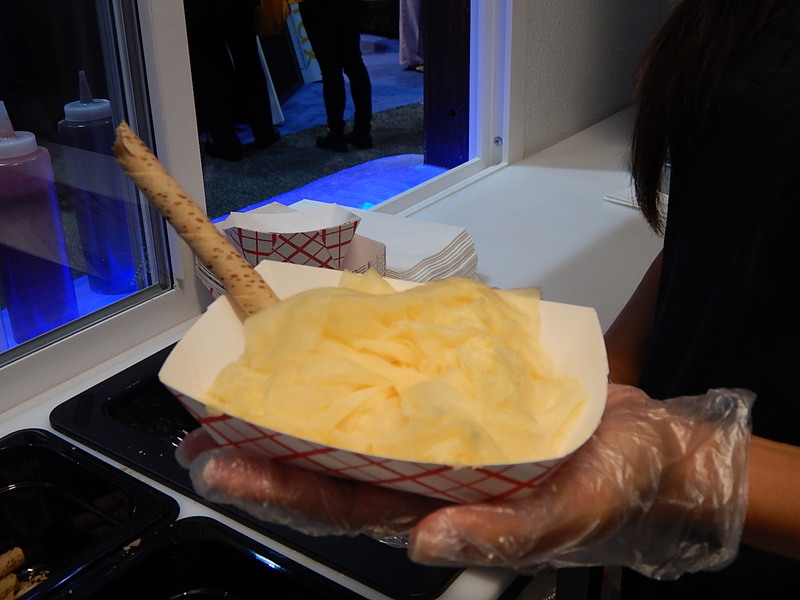 On the day I visited the Chilly Ribbons booth at IAAPA 2013, I sampled their mango flavor. The end result doesn’t taste anything like shaved ice and more like liquid cotton candy. Once it hits your mouth it literally dissolves on the spot because the ribbons are so thin, but much like cotton candy, is extremely flavorful and much lighter than traditional shaved or Italian ice. Hopefully they signed a few contracts at IAAPA and you’ll find this at theme parks around the United States in 2014! The Scare Factory, based out of Ohio, creates haunted attractions and everything you could need in it. Easily the most animatronic eye candy you’ll find at any booth in IAAPA. This year, Scare Factory featured a shooting gallery themed to an Egyptian tomb complete with mummies and zombies that spring from coffins when certain triggers are activated. Scare Factory specializes in effective scare robotics at extremely reasonable prices for start up haunted houses looking for a cost-efficient, yet effective solution. 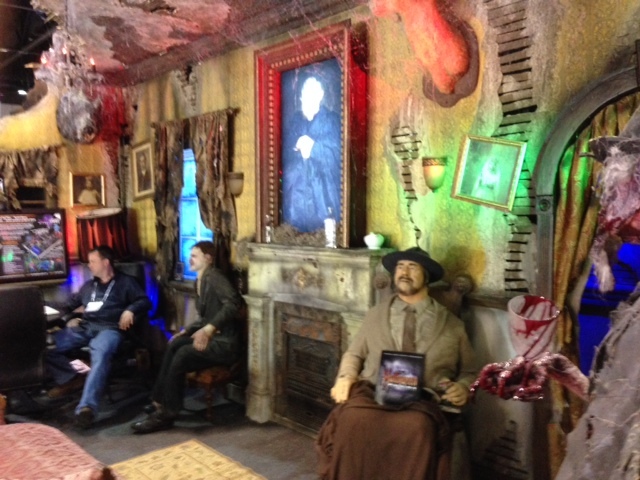 However, there are several companies at IAAPA looking to sell you everything you need for a haunted house. Halloween Productions Incorporated will create just about every haunted prop you will need for haunted attractions including dark rides and black light walk through. Halloween Productions has created attractions for Six Flags and Cedar Fair amongst many others. These guys not only create haunted houses, but museum exhibits, dark rides and even black light mini-golf with amazing attention to detail Check out their website at HalloweenProductions.com. Come back to Theme Park University later this week for even more from IAAPA 2013. We’ve got plenty more to cover in the days ahead. Be sure to follow us on Twitter by clicking here and like our Facebook Page by following this link. This entry was posted in Theme Parks 101 and tagged Chilly Ribbons, Halloween Productions Incorporated, IAAPA 2013, Scare Factory. Bookmark the permalink. Trackbacks are closed, but you can post a comment.